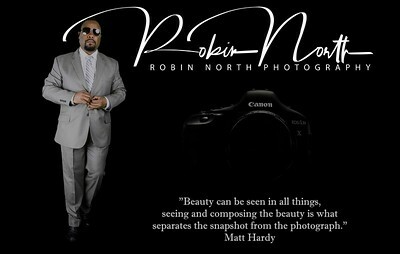 My name is Robin North Sr. I’m a business man, but I love creating memories. Photography is my calling, my passion, and the thing that will undoubtedly drive me insane someday. I don’t photograph subjects. I photograph the way they make me feel. I work with my clients to create their vision of their photos through their own personal eyes. I use my skill set to make that vision come to life in my photography. Undeniably, it’s a bit of a strange concept that is outside the norm. But it’s the truth and it is simple – and it’s the best way to describe my approach to the craft. I sometimes struggle with every image I shoot and many in the business world would consider bad practices as time is money. However, providing my clients with an experience that is outside the norm is what separates my approach from others. I assume perfection is possible and I want to squeeze it out of every picture. If that’s all you ever know about me, it’s enough to say you know me very, very well. It’s easy being you and I want to bring that out of every picture you take.